Upcoming stewardship event in Woodmont Park is example of how to help. 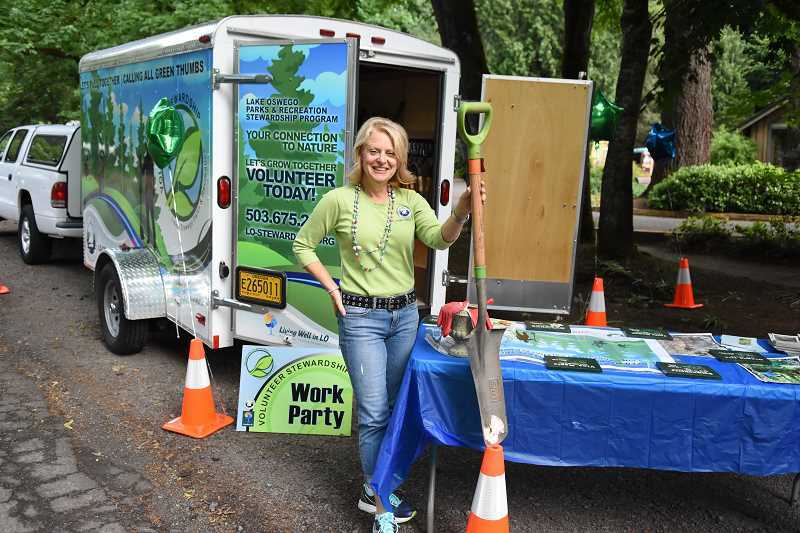 Babs Hamachek, the Lake Oswego Parks and Rec stewardship coordinator, can get you connected to a project fitting your interests. Looking for stewardship and volunteer opportunities? Babs Hamachek, Lake Oswego Parks & Rec's stewardship coordinator, can suggest some projects that might intrigue you. Music Bootcamp — Spend the day playing instruments (drums, guitar, piano, etc.). Sing songs, dance to tunes, play musical games and more. For ages 6-10; 9 a.m.-4 p.m. on Friday, March 22; Christ Church Parish (1060 Chandler Road); $72. Pioneer Days — Spend your day off at Luscher Farm. Enjoy games, crafts and activities while learning about pioneers who settled the Willamette Valley. Bring a sack lunch and water bottle. Campers will spend time outdoors rain or shine, so dress in layers and wear closed toed shoes. For ages 5-12; 9 a.m.-4 p.m. on Thursday, April 4, or Friday, April 5; Luscher Farm (125 Rosemont Road); $60. 50+ Zumba Gold — Ditch the workout and join the zumba party. Enjoy rhythms set to high-energy Latin and international music. Cardio-based class combines fast and slow rhythms that tone and sculpt the body using an aerobic approach. Easy-to-follow dance moves and no previous dance experience necessary. For ages 50+; 4-5 p.m. on Mondays, March 18-April 29; Adult Community Center (505 G Ave.); $50. Herb Gardening Basics — Learn the basics of herb production, like how to choose plants for your site; propagation; and planting and harvesting herbs to use in your kitchen. Participants will leave with three easy-to-grow plants and seeds to start later. For ages 16+; 1-2:30 p.m. on Saturday, March 16; Luscher Farm (125 Rosemont Road); $15. Planning a Perennial Garden — Learn how to create a gorgeous perennial border and what to plant to get year-round color and interesting textures. Learn how to plant for sun or shade. This class is offered through the Rogerson Clematis Collection. Register at rogersonclematiscollection.org/events, and pay online. For ages 18+; 10 a.m.-noon on Saturday, March 23; Luscher Farm (125 Rosemont Road). Bob Ross Oil Painting — "Pretty Pansies" is the focus of this easy step-by-step class, suitable for beginners to seasoned painters. Take home your own unique masterpiece at the end of the one-day class. All supplies provided. Visit loparks.org to view paintings. For ages 12+; 5:30-9 p.m. on Monday, March 25; Christ Church Parish (1060 Chandler Road); $49. Just Sing for Teens — If you love to sing, this class is for you. Get your friends together and unite your voices in song. Learn the basics of proper vocal techniques and warm-ups. No singing experience required. Registered Teen Lounge participants can attend this class for free. For ages 11-17; 5-6 p.m. on Wednesdays, April 3-May 29; Christ Church Parish (1060 Chandler Road); $75. Class information is in the Parks & Recreation Activities Guide and online at loparks.org. You may register by internet; mail; drop-off during business hours at Lake Oswego Parks & Recreation at the Public Golf Course, 17525 Stafford Road, Lake Oswego 97035; by fax at 503-697-6579; or by phone at 503-675-2549. Non-residents generally pay more than fees shown. Scholarships are also available for Lake Oswego residents.